Internet-shop of flowers and gifts Flowers.ua will help you in the shortest time deliver flowers to any place of Ukraine or the world and make it in the highest level. If you order online you have several advantages. 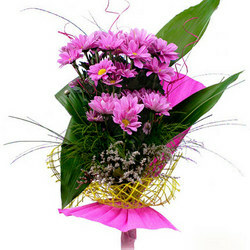 First of all, delivering of flowers can be ordered without leaving your home or office. Ordering of flowers will take a few minutes. Moreover, we provide emergency delivery of flowers - delivering at the day. Delivery of bouquets is always a pleasant surprise for the recipient. Delivery flowers to Ukraine always make an impression. Flowers delivery is a service for significant people who appreciate the professionalism and quality service. Only fresh flowers if you send flowers to Ukraine with our shop. Delivery service Flowers.ua favorably differ from ordinary flower shops, which are forced to store the flowers in the shopwindows. We make each bouquet personaly for order, due to this, we always deliver only fresh flowers. The level of prices and services allowed companies Flowers.ua to achieve a leadership position in service delivery flowers to Ukraine. Over the years of our work in the delivering service of flowers and gifts to Ukraine and the world we got a great number of positive feedback from our customers. Send flowers to Ukraine from Flowers.ua - it is always high quality and on time. Very Helpful, Responsive and Co-operative. Catered to my needs and changes, especially as a first time customer trying to familiarize myself with the website. A good range of gifts and presents of all types also makes this a very good website to deal with in the future for most occasions.